Increases profits and decreases risks. Greater Accuracy and Readability. Other magnetic gauges fail to compensate for the gravity effect so that they give readings differing by up to 40% when measuring paint of exactly the same thickness on top panels and side panels. 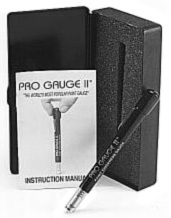 Pro Gauge II®'s two scales give accuracy of better than .001 (one thousandth) of an inch. The large indicator and clearly marked scales make Pro Gauge II® fast and easy for anyone to use. Plus there's room for the user to add his own markings and scales. Thick paint means problems. If the surface being painted has too much existing paint, cracking and other paint failure will soon occur. For example, application of lacquer paints and many enamels becomes risky over existing coatings thicker than .006. Even the most durable new enamels are likely not to last when applied over coatings exceeding .009.